සමස්ත ලංකා ගවේෂණ තරගාවලි වසන්තයේ අවසානය වන මාතර රාහුල විද්‍යාලයීය බාලදක්ෂ සමූහය සංවිධානය කල සිංහයන්ගේ පිබීදීම – 2018 බාලදක්ෂ ගවේෂණ තරගාවලිය මෙවරත් අකුරැස්ස බෙරලිය රක්ෂිත වනාන්තරයේ දී පැවැත්විණි. මෙම තරගාවලියේ ජය සංකේත ප්‍රදානෝත්සවය අති උත්කර්ශවත් ලෙස මාතර සමුපකාර මන්දිරයේ දී පැවති අතර එහි ප්‍රධාන ආරාධිත අමුත්තා ලෙස රාහුල ආදී ජනාධිපති බාලදක්ෂ කොලඹ විශ්ව විද්‍යාලයේ හිටපු කථිකාචාර්ය හා කෝමර්ෂල් බැංකුවේ ජේෂ්ඨ කළමණාකරු කපිල සචින්ත ලියනගේ මහතා සහභාගී විය. 08 වැනි වරටත් සංවිධානය කල සිංහයන්ගේ පිබිදීම සමස්ත ලංකා බාලදක්ෂ ගවේෂණ තරගාවලිය සඳහා දිවයිනේ පාසල් 35 ක් නියෝජනය කරමින් බාලදක්ෂ කණ්ඩායම් 45 ක් සහභාගී වූ අතර රාහුල විද්‍යාලයීය ආදි ශිෂ්‍ය සංගමය හා ආදී බාලදක්ෂ සංගමය රාහුල බාලදක්ෂ භාර ආචාර්ය හා සහාය දිසා කොමසාරිස් නිහාල් රංජිත් කොඩිතුවක්කු මහතා ඇතුළු බාලදක්ෂ සමූහය විසින් සංවිධානය කටයුතු සිදුකරනු ලැබීය. රාහුල විද්‍යාලයේ විදුහල්පති එෆ්.වෙලෙගේ සහ දිසා කොමසාරිස්, සහය දිසා කොමසාරිස්වරුන් ඇතුළු ආරාධිතයින් රැසක් මෙම අවස්ථාවට සහභාගී වූහ. 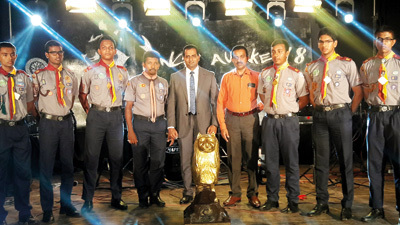 ‘Lion’s Awake’, the 8th annual all-island Scout Exploration competition organized by the Scout Troop of Rahula College, Matara, was held recently at the Beraliya Forest Reserve in Akuressa. 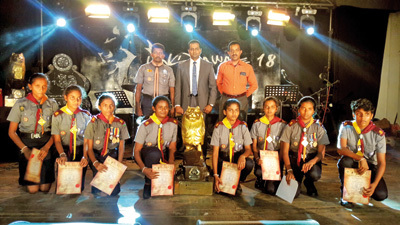 The Scout Troop of Ananda College, Colombo emerged overall winner in the Boy Scouts competition while Karandeniya Central College emerged victorious in the Girl Guides competition. A total of 45 Scout Troops representing 35 schools islandwide took part in the competition. Bandaranayake College, Gampaha. were the overall runners-up in the Boy Scouts, while St Mary’s College, Matara were overall runners-up among the Girl Guides troops. St. Aloysius College, Ratnapura won the Boy Scout Observer competition while Sujatha Vidyalaya, Matara, won the Girl Guides competition. A.W. Bandaranayake from Thurstan College, Colombo, won Best Explorer in the boys’ category, while Malshi Hansika of Defence Services College, Colombo, won Best Explorer in the girls’ category. The awards were presented at a ceremony held at the auditorium of the Matara Cooperatives Office. An old boy of Rahula College, President’s Scout, former Lecturer at the Colombo University and Senior Manager of Commercial Bank, Kapila Sachintha Liyanage was the Chief Guest. …….BEST WISHES FOR WINNING TEAMS…..